As the afternoon’s weather in Longdon was not quite warm enough for basking in the beer garden of the Swan with Two Necks, I took myself off for a little wander. The pub has a late 19th century map mounted on the wall, and it shows that the building next door was once a smithy. I’ve always had a soft spot for these simple buildings, softened even further by the discovery that one of my ancestors was an innkeeper with a sideline in blacksmithing. One of these days I’ll stop romanticising about it and actually get around to visiting Cirencester to see whether the forge is still there. For now though, back to Longdon, where in May 1918, the then blacksmith, a Mr T Broadhurst had decided to give up the business and was selling the tools of his trade. On offer was a grindstone on a iron frame, two circular double blast bellows (nearly new), a treadle drilling machine, two black staple vices and other useful tools. The building remained a forge until 1938 and now is home to the WI. 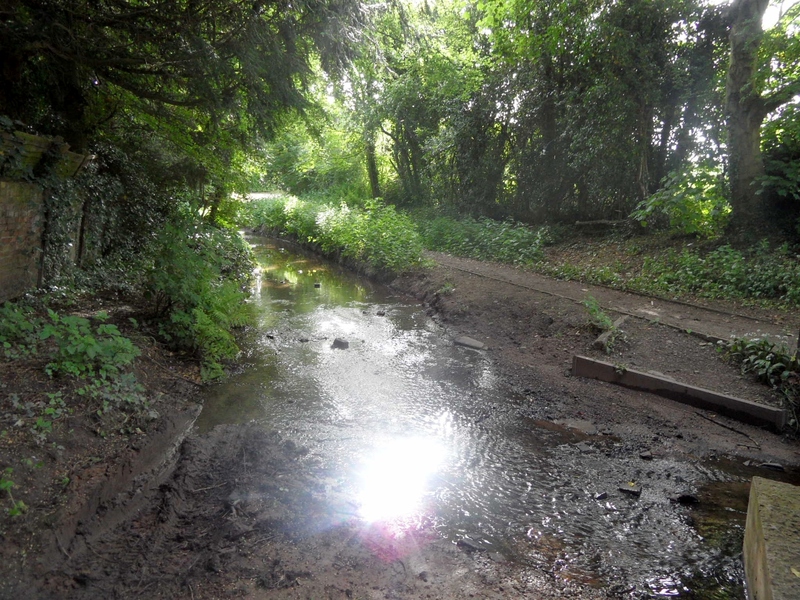 Something else that appears on the pub’s map is a ford, which as the name suggests, is at the end of this lane. I had a walk down and within minutes found myself alongside the Shropshire Brook. I stood for a while on the little footbridge watching tiny yellow birds flit between the trees and the water’s edge. Interestingly, on earlier maps this seems to be called the How Brook. I don’t know much about fords, other than they are a way of crossing streams and rivers, presumably at their shallowest points. Whilst reading up on them at home, I came across a surprising account of an event that seems to have taken place here or very nearby (1). Sir William Wolseley … lost his life about the beginning of the last century* in a very singular manner. He went to Lichfield one morning about nine miles from his house in his coach and four and on his way passed a little brook which runs across the road at Longdon and which is so shallow that a foot passenger can easily step over it the water being kept up by a mill dam at some distance from the road. 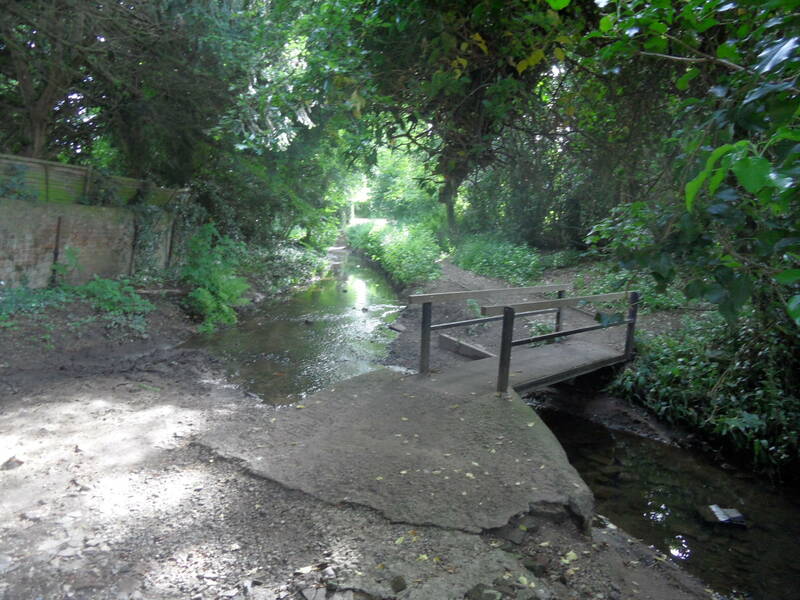 When Sir William Wolseley reached this brook on his return home in the evening the mill dam just at that instant suddenly gave way the water rushed across the road overturned the carriage and drowned Sir William with his horses. The coachman was thrown off the box into a tree and escaped. Could this these gently flowing waters really have caused such devastation? It’s hard to imagine. A reminder, I suppose, that whether it’s the fire of the blacksmith, or the water turning the mill wheel, we can manipulate the elements of nature, but we are never fully in control. (1) – A topographical and historical description of the Parish of Tixall in the County of Stafford, Sir Thomas Clifford and Arthur Clifford Esq, 1817. This entry was posted in Lichfield, staffordshire, stories, streams, water and tagged blacksmiths, Brook End, fords, forges, history, Lichfield, Lichfield history, Longdon, pubs, Shropshire Brook, Staffordshire, Staffordshire history, stories, streams, Swan with two necks, water, Wolseley by Kate. Bookmark the permalink. 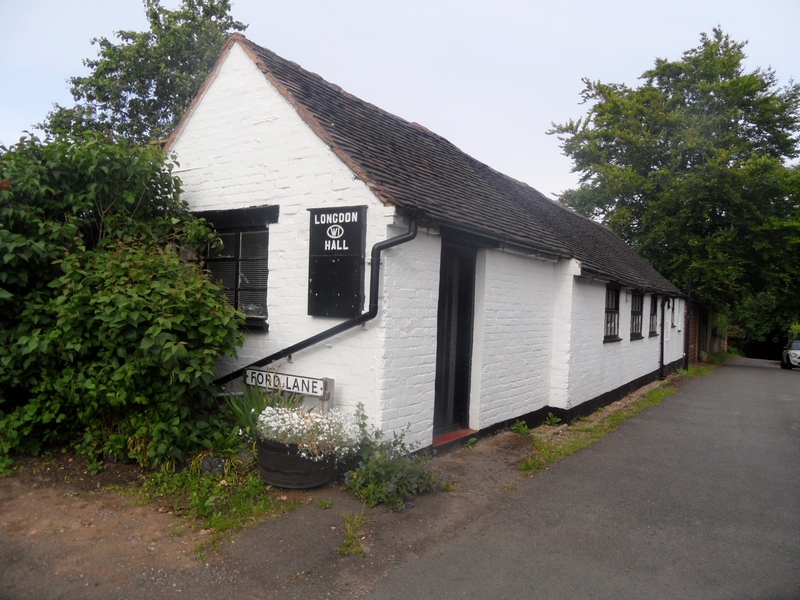 Fascinating post – I had no idea about the history behind the WI Hall in Longdon, and I felt so sorry for that poor man who lost his life at the ford, which looks little bigger than a large puddle. But even today flash-floods cause devastation – think of the Boscastle flood a few years ago. Thanks Christine. I love water as I find it calming, but as you rightly point out, it can be so devastating as well, and sometimes with very little warning.